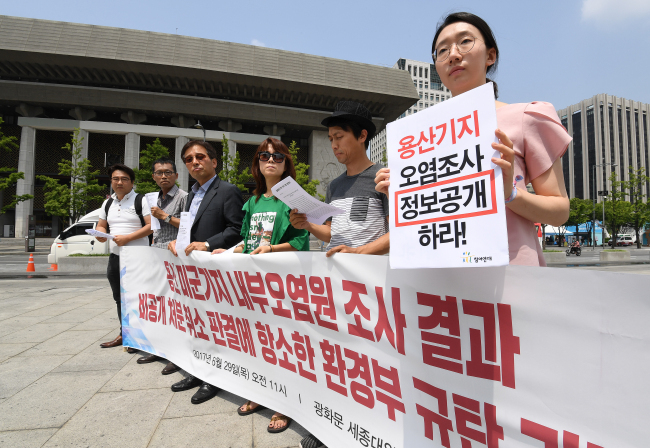 The Seoul Metropolitan Government will file a lawsuit against the central government for the cost of cleaning up contaminated underground water near the US military base in Yongsan, central Seoul. The city government is seeking compensation of 540 million won ($480,000) for the cost of purifying oil-contaminated groundwater around Camp Kim and near Noksapyeong Station. According to the city government’s internal inspection last year, the average benzene concentration near Yongsan Garrison recorded 8.811 milligrams per liter, approximately 587 times higher than the permissible level of 0.015 milligrams per liter. Benzene, a component of gasoline, diesel and a Group 1 carcinogen classified by the World Health Organization, was found at 10 spots around the camp. So far, the Seoul Metropolitan Government has spent over 7.8 billion won to clean up the area near the two of the sites over a decade. It has recouped money spent on the work through yearly lawsuits against the central government. Based on the Status of Forces Agreement between South Korean and US forces, the responsibility to compensate a third party for a damage related to US military bases lies in the South Korean government. This is the 13th time Seoul has demanded compensation since the oil contamination was first reported in 2001. Concerns have been intensifying over the health effects of exposure to contamination on the base. Following the relocation of key military bases in central Seoul to Pyeongtaek, Gyeonggi Province, by 2018, the area will turn into a public park. The central government has demanded that US Forces Korea bear 75 percent of the cleanup costs in accordance with the SOFA, but it has not received that money.